The stage name for Edward White whose career kicked off his career with a Top Ten hit his first time out and then never approached that success thereafter. Born in 1918 in Philadelphia his family moved to California in 1922 and he studied music in school but hadn’t thought of becoming a professional musician until he was working in dry cleaning and was heard singing by his co-workers who encouraged him to give it a shot. He then impressed the owner of a night club when he sang at a talent show held there and the club owner offered him a steady job as a performer, which he turned down, still not convinced he could make it. When the bandleader offered to work with him to polish his performing skills he relented and was soon earning a living singing under the name The Great Gates (Gates being his middle name). Signing with the newly established Selective label in 1949 he got his one and only hit right off the bat with “Late After Hours”. Though a its success was especially noteworthy considering Gates’ own inexperience, as well as that of the teenaged band behind him (including future notable Marvin Phillips on sax), not to mention the inexperience of the company which issued it, he never was able to build off that early shot at fame. In the years to come he bounced from one label to another, releasing records under his full given name as well as his performing moniker, always able to keep his career afloat yet never becoming a star as it briefly appeared he might be able to do when starting out. 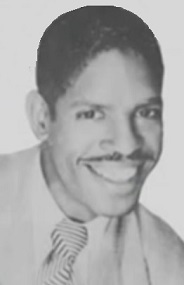 By the late 1950’s he’d opened a nightclub and having difficulty with finding and keeping a pianist to anchor the proceedings he learned the instrument himself and would go on to record as an organist in the early 1960’s with one album he released entitled The Man On The Moon Ed Gates On Organ, which gave him another nickname which he’d continued to use thereafter as strictly a club performer. Gates was still active locally around Los Angeles until the mid-1980’s and died in 1992 at the age of 74.